We're used to Chloe bailing out at the first hint of trouble - so will she do the same in her hunt for the Tusk of Ganesha? History is the key to Uncharted: The Lost Legacy. Granted, it’s the motivation behind all the other Uncharted games, but this time I’m not talking about the search for a magical jewel or hidden city. Sure, Chloe has her sights set on a bejewelled Tusk of Ganesha, but Lost Legacy is more concerned with its characters’ past, uprooting everything you thought you knew about the brash Chloe and the stoic Nadine to show how they became that way. 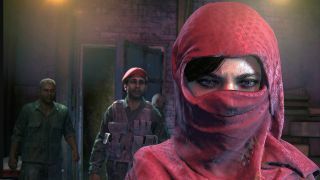 I spoke with Lost Legacy’s creative director Shaun Escayg and Naughty Dog’s community director Arne Meyer about the characters’ journeys. “At Naughty Dog the best story wins”, Shaun tells me. And Chloe has one hell of a story to tell. She’s typically “the getaway driver, always bailing out, ready to cut her losses and run,” says Shaun. “What if she had a job with personal significance that she had everything to lose on - would she cut and run?”. No. Despite the temptation to flee being one of Chloe’s major weaknesses (or strengths, if you’re as self-interested as she can be), she continues to stride through India’s Ghats in search of the Tusk. Rumoured to be the key to understanding the entire Hoysala civilisation, it was a symbol of their power over the region. Yet she’s not seeking it just for the money - her father was the first to venture after it. He failed. Continuing his quest herself, this adventure has far more significance for Chloe than she lets on, and will at times challenge her self-preservationist streak. By the sounds of it identifying with her won’t be a stretch either. “Chloe is just like us in more of a sense than Nathan was - she doesn’t really know everything,” Shaun says when I asked why they chose her. “She just has enough information to take us to the next clue and we have to solve it”. It’s true: instead of a log full of clearly-explained missions, you have a paper map. Scrawling symbols on it each time she finds something new, there’s a genuine sense of impromptu discovery each time Chloe gets her pen out. A back-to-basics habit which I have no doubt she inherited from her dad. At the core of the story is the Tusk, a reminder of Chloe’s childhood and, more importantly, her archaeologist father who sought it first. “What was this treasure created for, what was it in a historical sense?”, Shaun asks. “By going after this treasure it confronts a past that she’s been trying to avoid. Then Nadine inflicts that pressure that starts breaking Chloe, and you get to see a new side of her”. Unlike Chloe, the hard-as-nails Nadine isn’t one to bail out at the first sign of trouble. Although she stays resolutely by our protagonist’s side, getting under the mercenary’s tough exterior is harder than climbing to the top of the worryingly crumbly-looking towers. See, Nadine and Chloe aren’t exactly friends. “While they have a common history they’re at opposing ends of that history,” Arne says. “It helps create the sense of distrust, and the sense of friction between them”. You can sense it in the way they talk. At the beginning Chloe is her usual flippant self, every canny observation paired with an off-hand remark. Each one is an opportunity for Nadine to start a repartee with the cocky adventurer, yet they fall flat. Deliberately. Although Shaun describes her as “very intelligent, very capable, very deliberate in certain aspects”, all these qualities fold themselves into her professional side. ‘Professional’ for Nadine means breaking bones and cold military tactics. Getting any deeper into her psyche is going to be as difficult as outwitting her on the battlefield. However, when I hunt down a monkey temple surrounded on all sides by a massive ravine, the mercenary softens slightly. “Monkeys!” she coos gently. Nadine likes monkeys. Attempting to dig deeper into her adoration of the white-furred mammals results in her shutting down quickly again, but this peek into her fun-loving side was exactly what I needed to make sure I didn’t give up on the idea of her eventually becoming - dare I say it? - a friend. Whereas Nadine is an antagonist in Uncharted 4, turning her into a companion was a refreshing challenge for Shaun. “Everyone’s not good or bad, just motivated differently,” he explains. That even goes for the villain of the piece, Asav. Previously a doctor, he’s much more of an academic than any baddie we’ve seen in Uncharted. “You’re not sure if you hate him yet,” Shaun says. At the heart of his battle with Chloe is a love for his heritage. It’s a pity that the conquest of the ancient Hoysala people by Persian invaders has corrupted his fervour, though. The way Asav sees it, according to Shaun, is that “somehow the New King led to the Persian invaders taking my treasure and weakening my society. He’s not that bad and has some ideals that are pretty succinct with whatever you feel,” Shaun says, “but he’s also been corrupted by that idea. He’s so living in that idea that he hasn’t even seen that he’s doing this for very superficial reasons at his core too which is control and power and everything else”. Like Nadine and Chloe, he’s more complicated than he first appears. Meeting him for the first time is unnerving. Quietly spoken in a deceptively measured voice, Shaun describes Asav as “one of the most grounded characters we’ve messed with. [He’s] methodical, he’s a thinker, not your typical villain, he’s deliberate, trying to figure out with each question who you’re here with, what you want”. Not that he’ll need to ask that question of Nadine - the two know each other. Somehow. When I ask about their past, all Shaun will say is that “they’re all connected in this world”. Yet while I’m driving around and Chloe slyly observes that Asav has “a thing” for Nadine, the mercenary will only reply with “proved useful at the time…”. Maybe he’s nursing a broken heart. “With all great stories you want conflict and growth”, Shaun says. There’s certainly enough conflict in Lost Legacy from the brief demo I played (judging by the amount of bullets that flew past my head), yet I only got a glimpse of the characters’ growth. But that’s the point. Nadine and Chloe aren’t going to open up easily, so you have to invest time in shedding their steely demeanour. You have to earn it. “Could they become a hero?” Shaun asks. We’ll just have to wait and see.